I’ve been using Cinema 4D for some time now. A lot of times when I’m modeling, I find myself using the Split command quite a bit. 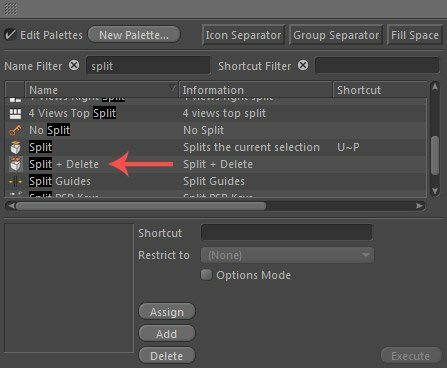 The Split command enables you to take a selection of polygons from an object and create a separate object based on your selection. A lot of times I end up deleting the old selected polygons from the original object, as it leaves them behind when creating the new object. When you delete polygons in Cinema 4D it leaves behind the points/vertices as well, making you perform an Optimize command to get rid of the stagnant points. With my experience, this ends up being a bit tedious when all I want to do is take one object and split it into two separate objects. 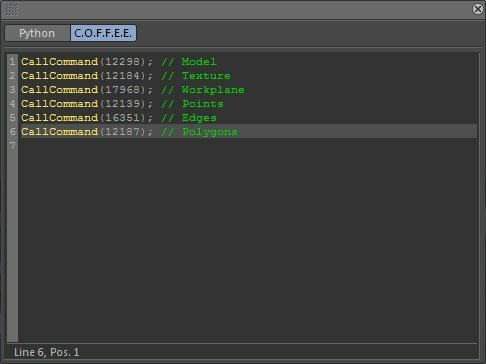 I did some digging and discovered the Script Manager in Cinema 4D. At first it scared me, as I thought I was going to have to learn how to program/script, and personally that’s just not my thing! Upon finding the Script Manager, I also found the Script Log. The Script Log basically records your actions every time you perform a new command, switch modeling tools, make selections, etc. It’s very similar to the way Macros in Microsoft Word and Actions in Adobe Photoshop work. At this point, the only thing you have to do is copy the above code from the Script Log, open the Script Manager found in Scripts → Script Manager… and paste it into a new script. From here, all you have to do is select your object, select your polygons that you want to separate, and execute the script. If you save the script, it will be added to the Customize Commands dialog, where you can then add it to your interface, or create a keyboard shortcut. The Customize Commands dialog is found under Window → Customization → Customize Commands. You can also click on the Shortcut button in the Script Manager to quickly open the Customize Commands dialog. That’s pretty much all there is to it! It has sure saved me a few extra steps in the modeling process! If you have any questions, feel free to leave your comments below and I will try to answer them as quickly as I can! 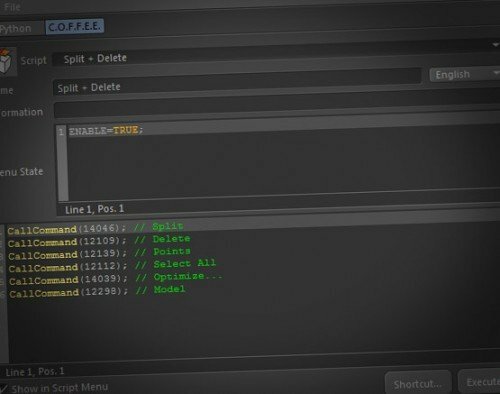 After doing a bit of research online, I made a small update to the Split+Delete script. The below code will now select the newly split object in the object manager and center its axis. Hey man, haha it’s actually been a while since I’ve messed around with the macro stuff in C4D. 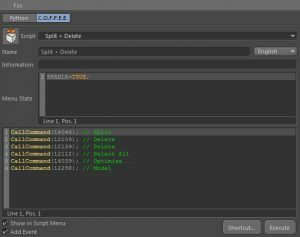 So you want a click a button and have a custom spline load into your scene? Yeah exactly! I’ve made custom splines already and i can drop them in from my presets folder but i want to just click a button like you do with c4d base splines, any ideas? So I did some research and figured it out! I named mine matthew. Then just drag your object you want into that library. I just used spline for the name. Then I made a custom script (and by made, I mean I found bits and pieces of other scripts I found online and made it work lol). Open the Script Manager and import this script: Import from Content Browser. The two lines that have “preset://matthew.lib4d/spline”… change that to the name of your preset library and the name of the object you dragged into the Content Browser. When you hit Execute, it should drop it into your scene! Then as outlined in the main tutorial, you can use the Customize Commands window in C4D to drag this in as a button into the C4D interface for one click operation. This should do it! Let me know if you run into any problems! Oh Genious, I thought it was something like that but i wasn’t sure how to piece the code together, I found that mergedocuments script on the maxonSDK and knew it was something along those lines! Hey Rafael, they may have changed this somewhat from when I first wrote this haha. 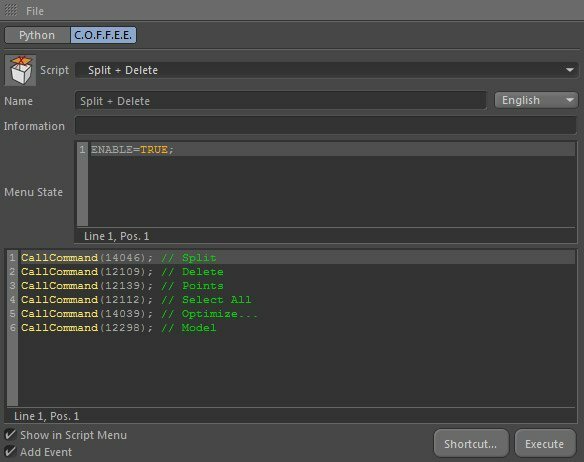 If you open the Script Manager and make sure you’re on the COFFEE tab, just click File > New. Then if you select the script that’s already there, you should be able to delete it, then add your own in. Let me know if you still have issues! Thank you very much for the help!!! Thanks for sharing this man, just what I was looking for. This makes me want to throw up…. I can puke better macros then this! © 2019 Matt Rittman. Less than a few rights reserved.